Whisk sugar, olive oil, vinegar, onion juice, mustard, salt, and onion powder together in a bowl until sugar is dissolved. 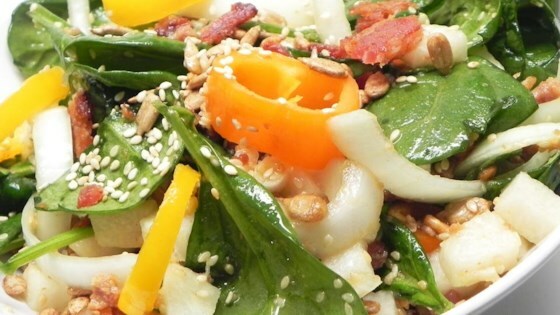 Mix spinach, jicama, onion, bacon bits, sesame seeds, and pine nuts in a large bowl. Pour olive oil dressing over the salad; toss to combine. I used roasted sunflower kernels in place of the pine nuts due to what was available in the supermarket but other than that, I made as written. One word...EXCELLENT!